On Taco Tuesday last week I wanted to jazz things up a bit. Instead of making my basic, everyday, beef tacos, I made these beautiful and exotic looking Baja Chicken Tacos! and Cumin on both sides. I forgot to photograph this step, but you will need to place a skillet over medium/high, and allow it to get hot. Once the pan is hot you will cook the chicken 4-5 minutes on each side until the juices run clear and the center is no longer raw. While the chicken breasts are cooking you can make the Baja Sauce. You will need to remove ONE chipotle pepper from the can. Using your knife, mince the pepper up very finely. Now place the pepper into a mixing bowl. To the pepper in the mixing bowl, you will need to add the greek yogurt. By us using greek yogurt instead of sour cream or mayo you are saving yourself calories! Lots of flavor, none of the guilt! Mixing everything together and taste. Give the sauce a couple of seconds to decide if the spice is right for you. This is the kind of spice that can really sneak up on you. This may be fine, but you may like your sauce with a little more kick. If you would like more spice, just add a little of the adobo sauce from the can until you get the heat that you want. After the chicken has fully cooked, remove it from the pan and dice it up. This part os really fun. To get those beautiful charred marks on your corn just place the tortilla right over the flame on your stove for 30 seconds to 1 minute, then flip. If you don't have a gas stove you can do this is a dry pan. 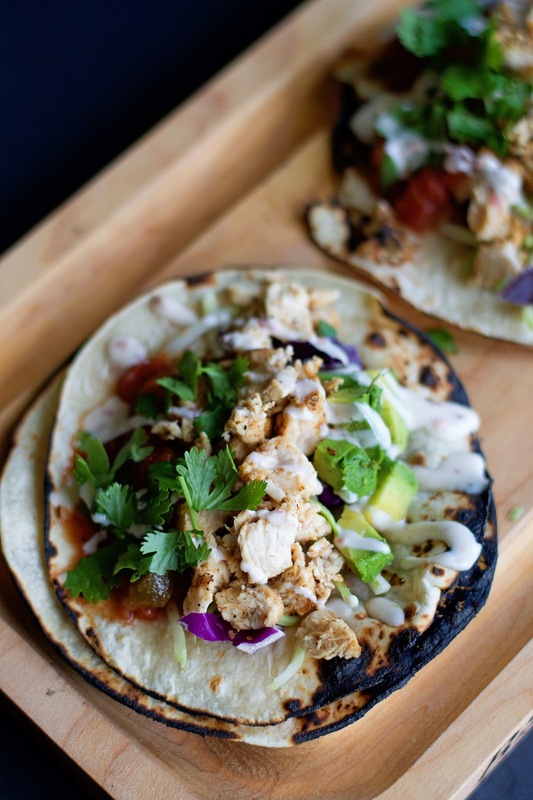 Place two charred tortillas on your plate. I use two because the corn tortillas tend to be a little brittle sometimes. Then I lay down the broccoli slaw. I like using the broccoli slaw in this dish because it's one of those sneaky ways to get nutritious veggies into your child's meals without them knowing! 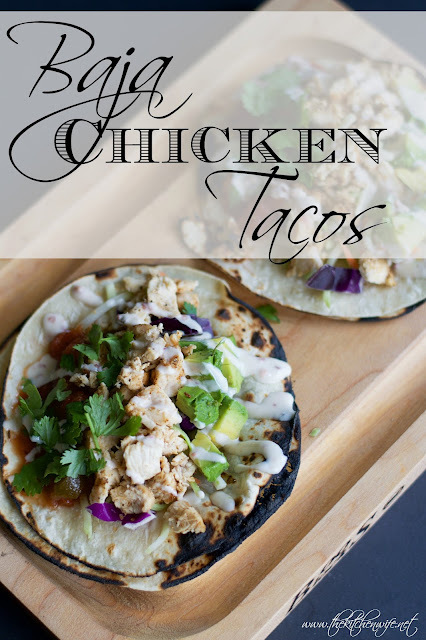 Next place the chopped chicken on top of that and drizzle a little of that AMAZING Baja sauce, and then top with some salsa, cilantro, lime, and avocado! Place a skillet over medium/high heat, add a little oil, and let the pan get hot. Season the chicken with the salt, pepper, chili powder and cumin on both sides. Once the pan is hot place the chicken in the pan and cook on both sides for 4-5 minutes. When the chicken has finished cooking, remove from pan and chop into bite-sized pieces. 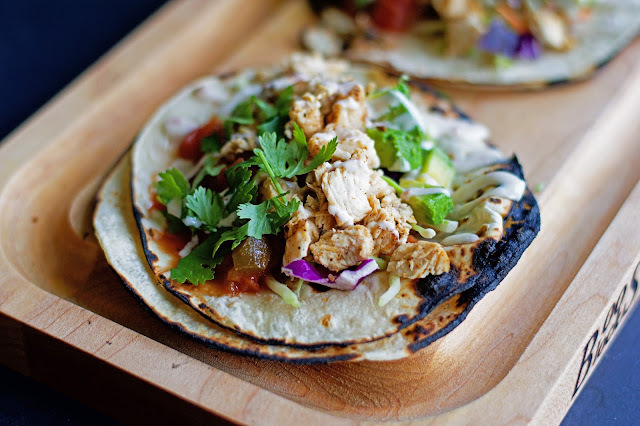 Assemble the taco with the slaw and chicken, drizzle on the sauce, and then add the topping of your choice. *If you want the Baja sauce to have been a little spicier, add a little more of the adobo sauce from the can. **If you do not have a gas stove you can achieve this in a dry pan. Thanks lady! I love a good recipe that is simple and healthy!